Earlier at D23, one of my Kingdom Hearts III predictions from awhile back got confirmed. Big Hero 6 will appear as a world within the game. When I wrote my article predicting the worlds in Kingdom Hearts III, I said that the two franchises would be a good fit because of their similar tones. It also isn’t hard to picture Sora on the same screen as Hiro and Neku. What I mean by Neku and Hiro sharing the screen with Sora is that I have a theory (a GAME theory) this world will feature the cast of The World Ends With You. To me, it makes sense because San Fransokyo is a logical place for Neku and the rest of the team to show up next since it’s similar to the real location of their game, Shibuya. Despite that, today another revelation was made on the game that might kill my theory. However, just because the world is continuing the Big Hero 6 story doesn’t necessarily mean that it will be canon within that universe. It could turn out to be just that the story is like an elseworld idea or something. If that is indeed the case, the TWEWY characters still could show up to resolve some of their plotlines from KH3D. Regardless of the TWEWY characters, Big Hero 6 shows something pretty significant about the state of Kingdom Hearts III. First, the announcement of the game in 2013 was way too early. 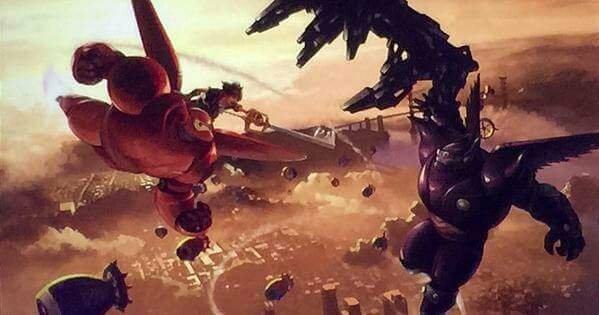 Most fans already assumed that, but I doubt this Big Hero 6 world was even planned for the game when the announcement happened. Second, it looks like most of the worlds for the game will be coming from more modern titles. That’s interesting because the series has repeatedly shown that it strives off of the nostalgia of the players and only a handful of times has dabbled in more modern movies. Lastly, with Big Hero 6 and Tangled worlds announced, it seems even more clear to me that a Frozen world will appear in the game. For how big that movie is, especially in Japan, it would actually be really weird if it didn’t appear in the game. With this game coming closer to release every day, we are probably only a few months away from getting a release date. Please be excited, KH fans.